Jennifer Sanger is a rainforest ecologist who studies epiphytes, which are plants that grow up in the canopy of trees. She also runs a non-profit environmental education project, called The Tree Projects, with herhusband Steve Pearce, which aims to educate people about the world’s significant rainforest trees (www.thetreeprojects.com). What made you interested in the study of nature? I find the natural world such a fascinating place. Especially rainforests- there is so much life and diversity in these forests and there is a special kind of magic to them. I think there is something about beingsurrounded by a wall of green that is deeply relaxing. I have also been a long-time admirer of trees. There are so many different species, shapes and forms. What fascinates you the most about you research? 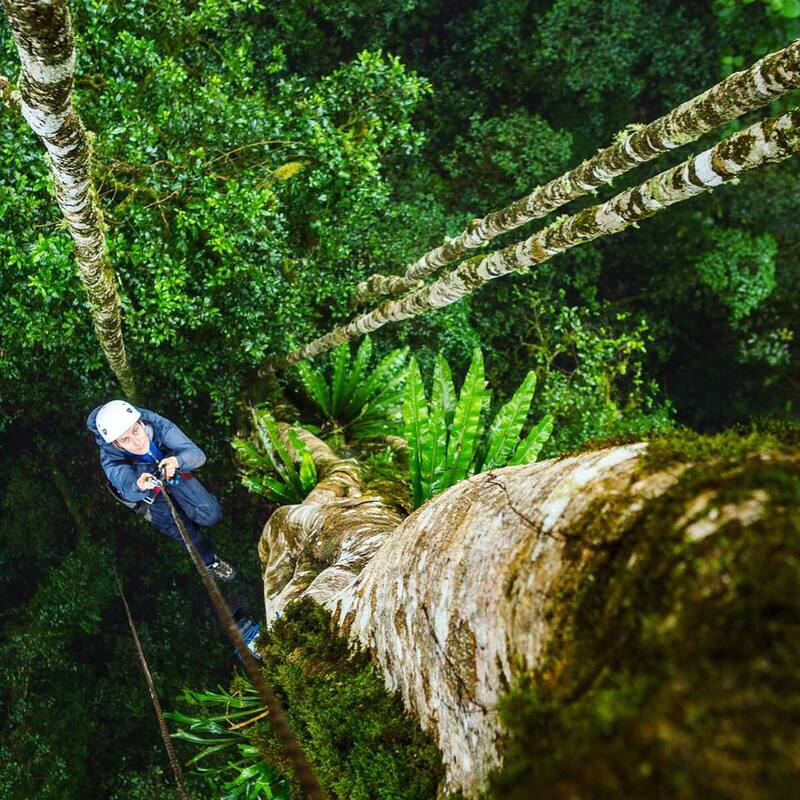 I study the plants which grow in the canopy of rainforest trees and in order for me to study them I have to climb up into the tree tops using ropes. It always amazes me how different the canopy of a rainforest is compared to the understory- most of us picture a rainforest as being dark, shady and humid, but up in thecanopy it’s the opposite. There is lots of sunlight, its warm, and there are many different species of plants and animals up there compared to the forest floor. Why do you think it is important to spread the science of nature? I think it is essential to make people aware of the importance of rainforests. They are home to so many amazing plants and animals, and they also provide much of the fresh air and clean water that we depend on. They are incredibly beautiful and inspiring places. This is what we try to do with The Tree Projects, to show people how wonderful trees and forests are, to help them appreciate places that they may never get the chance to visit. How often are you out in nature? I try and be out in nature every day. I am very lucky to live near the beach, where I can go for a run in the morning. I also spend a lot of my weekends and holidays hiking. I really love going on multi day walks. We are very lucky to be living in Tasmania, were we are surrounded by lots of amazing natural places. How do you feel when you are out in nature? Being out in nature regularly is essential for my happiness and wellbeing, it makes me feel so alive and happy. It’s such a great way for me to ‘clear my head’ and relax, like taking a deep, long exhale. I could not imagine what life would be like without it, and I always wondered how people living in big cities would be able to survive without a daily connection with natural places. What would you say are the qualities of nature that you embrace the most? I think it’s a little bit of everything, being outside you are just so much more aware of all the elements, the sun on your skin, the wind, the sounds of birds. I love to take the time to look at the detail in nature too, the patterns of a flower, the way the clouds pass over a mountain top, the different types of mosses growing on a log. There is just so much to appreciate and discover. What do you do to fit in a bit of nature in your daily life? I try to visit the beach regularly each morning before work. There is also a beautiful patch of forest near to where I work so I often walk here in my lunch times. I also try to get out every weekend and do a long walk in the forest- there are many different trails around the city which I live. Do you have any special place that you go to or have gone to that you would like to recommend? There are two places in the world which are special to me. Tasmania, where I live, is such a wonderful island full of mysterious rainforests, pristine beaches, rugged mountains and vast wilderness. There is so much to explore here. The West MacDonnell Ranges in Central Australia are also a very special place for me. They are a beautiful desert mountain range, with so many amazing plants and animals.